PITTSBURGH & CHICAGO & CONCORD, N.C.--(BUSINESS WIRE)--Mar. 6, 2019-- If you were to ask Ryan Newman what his favorite food on race day is, he would tell you it’s Oscar MayerBacon. This weekend at ISM Raceway, his love of bacon will be sizzling on the track and on the side of his No. 6 Oscar Mayer Bacon Ford Mustang. 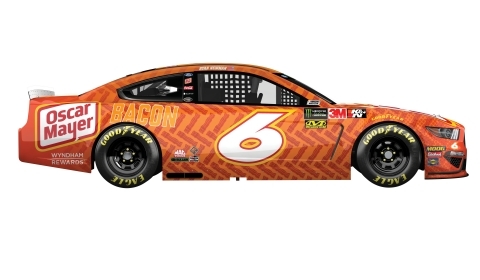 As part of the season-long rollout celebrating Oscar Mayer’s quality meat offerings, Newman’s scheme this weekend in Phoenix will feature individual slices of delicious bacon across the machine he will wheel in Sunday’s Ticket Guardian 500. Oscar MayerBacon is hand-trimmed, naturally hardwood smoked and naturally sugar cured — it’s no surprise that it’s on more family tables in the America than any other bacon out there. The Oscar Mayer team is proud of the quality taste and flavors featured in their line of bacon products. In addition to the best-selling Naturally Hardwood Smoked Original Cut, the Oscar MayerBacon line includes a variety of different cuts, from thick cut to center cut, flavors such as Cracked Black Pepper and Maple, as well as Turkey and Fully Cooked bacon products. After kicking off the 2019 season debuting the Oscar MayerDeli Fresh car in the Daytona 500 and this weekend’s bacon car, the nationally recognized brand will continue to celebrate its love of meat throughout the season. In addition to the bacon wrap, the iconic Wienermobile will once again take the track at ISM Raceway. Be sure to look for the 27-foot hot dog on wheels and its full-time brand ambassadors, the famous Hotdoggers. Phoenix happens to be a special place for Newman, who claimed his last win in the Monster Energy NASCAR Cup Series (MENCS) there in 2017. He also won at the 1-mile track there in 2010. Overall, the 2008 Daytona 500 Champion has 12 top-ten and 10 top-five finishes along with four poles. For more information about Oscar MayerBacon, Deli Fresh and Cold Cuts, visit OscarMayer.com or on Facebook, Twitter or Instagram.